After meeting Michael at the age of 20 and getting engaged just six months later, Toni from Norfolk assumed it would only be a matter of time before a baby came along. 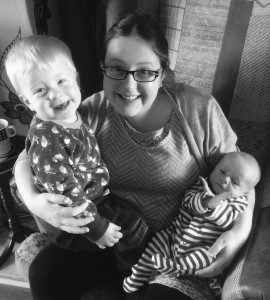 Toni had to wait more than ten years before her first child arrived, following successful fertility treatment at Bourn Hall Clinic, and is now finally, at the age of 32, a proud mum to son Thomas, aged two, and baby William. The couple tried for another year but still nothing happened. “In the August of 2008 I finally gave in and said to Michael that if we needed help then we should find out what was wrong,” she says. The hospital tests revealed that Toni had Polycystic Ovary Syndrome (PCOS), a condition which is a common cause of infertility. After a concerted effort to lose weight Toni was put on a number of medications by the hospital to try and boost her fertility and also had laparoscopic ovarian drilling to regulate her cycles. She still didn’t fall pregnant and so was referred for IVF treatment at Bourn Hall Clinic. 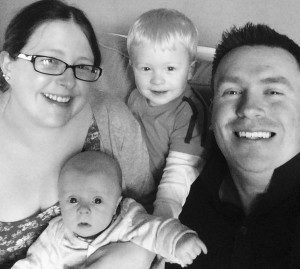 The second time around Bourn Hall decided to use a process called ICSI, which involved injecting Michael’s sperm directly in to Toni’s eggs. The couple were absolutely delighted when Toni found out she was pregnant but their joy was short-lived when she miscarried at seven weeks. “I was absolutely devastated,” says Toni. “It was a real shock as up until that point we had been trying for seven years to get pregnant and we had finally done that but it was not good enough – it had been such a massive hurdle actually getting pregnant that I hadn’t thought about getting through the actual pregnancy. Now I was going to worry that I might miscarry again and that was a whole new emotion”. Despite the latest setback Toni says that she and Michael did not consider for one moment giving up. Third time around Toni’s chances of success looked good. Eight eggs fertilised and four developed into blastocysts, with the Bourn Hall embryologist telling her that one of them looked “exceptional”. The “exceptional” one was transferred to Toni whilst three were frozen. Having waited so long to be parents Toni and Michael wasted no time in getting the ball rolling to try for a brother or sister for Thomas. “He was just three months old when we signed the paperwork for me to have treatment using the frozen embryos,” she reveals. In June 2015 Bourn Hall went ahead with treatment using the remaining frozen embryos and one was transferred to her womb. “When I got pregnant again we couldn’t believe we had been so lucky twice with the same cycle,” she recalls. William was born in March 2016. Click here to find out more about ICSI and the other treatments offered by Bourn Hall.